Grain markets tumbled Thursday following the USDA’s release of its Quarterly Stocks and Prospective Plantings reports. In his weekly preview to this Saturday’s SUNUP show, Kim Anderson, Oklahoma State University Grain Marketing Specialist, said the planted acreage was in line with pre-release estimates and did not have a big effect on markets. The effect of the Quarterly Stocks report, however, was another story. Anderson said traders were expecting wheat to come in at 1.18 billion bushels. The actual number was 1.25 billion bushels. Corn stocks were expected to post 5 billion bushels. The actual number was 5.4 billion bushels. Soybeans came in at one billion on an expectation of 940 million bushels. -- Jeff Edwards demonstrates how to check wheat for freeze damage and updates viewers on the crop's progress. Then, Bob Hunger looks at fungal disease in wheat. --In the Mesonet report, Al Sutherland analyzes the recent cold temperatures and shows us the latest burn index. --The crew travels to Enid to talk with Josh Bushong about Canola College and learn about plans for a new canola processing plant in Enid. --In Shop Stop, Randy Taylor and Wayne Kiner demonstrate a method to transfer irregular patterns between metal pieces. --In Cow-Calf Corner, Glenn Selk advises producers on how to deal with twin calves. 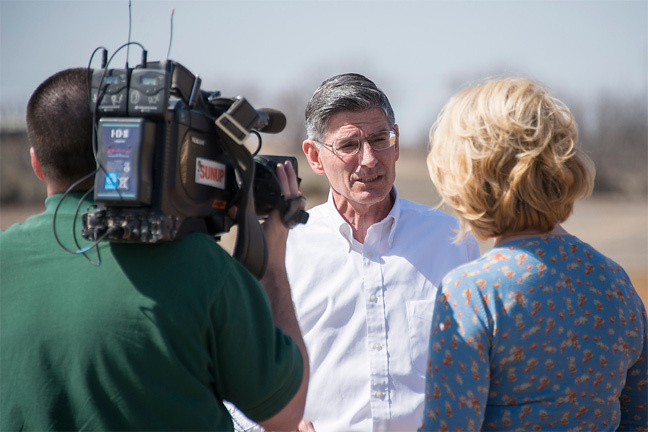 --Craig McKinley tells viewers about the Four-State Forestry on the Grow conference and Megan Rolf invites people to the annual meeting of the Beef Improvement Federation. -In Naturally Speaking, Dwayne Elmore compares deer tracks to wild hog tracks. -Finally, Brian Arnall encourages viewers to send photos of nutrient deficiencies in their crops to assist with future educational efforts. Catch SUNUP: Saturdays at 7:30 a.m. on OETA. You can watch archived programs online at http://www.sunup.okstate.edu or http://www.youtube.com/sunuptv. Kim Anderson talks about how the Quarterly Stocks reported impacted the grain markets.